There's just something about Apple that makes people go crazy whenever the company's lawyers do even the simplest things -- whether it's filing routine trademark oppositions, getting patents granted, or, uh, defending allegations that the company is in league with the Mafia, Steve and friends just seem to inspire some strong reactions whenever they end up in the courtroom. So of course things got a little wild last Thursday when Nokia announced it was suing Apple over ten patents related to GSM, UMTS (what you know as 3G) and WiFi -- the pundit class immediately set upon the idea that the lawsuit was some sort of reaction to Nokia's diminishing cellphone marketshare and the perceived dominance of the iPhone, perhaps best exemplified by John Gruber's flippant "If you can't beat 'em, sue 'em." Nokia can't compete against Apple, so obviously it's abusing the hopelessly-broken patent system get a little payback, Espoo-style -- right? Well, wrong. As usual, the race to hype this dispute as a bitter standoff between two tech giants desperate to destroy one another has all but ignored the reality of how patents -- especially wireless patents -- are licensed, what Nokia's actually asking for, and how it might go about getting it. And as you know, we just don't do things that way, so we've asked our old friend Mathew Gavronski, a patent attorney in the Chicago office of Michael Best & Friedrich, to help us sort things out and figure out what's really going on here -- read on for more. First, a preliminary note: we're just not going to get into the specifics of Nokia's ten patents, whether they should have been granted, whether they're valid, or whether the patent system itself is a good thing. Each of the ten patents in question covers a highly technical part of wireless communications, and we simply don't have the time to judge them on their merits -- and even if we did, we have no way of knowing how the iPhone's code and chipsets make use of the patented technology. As for the patent system, well, it's what we've got, this case isn't going to change it, and we're not going to begrudge Nokia for taking advantage of the primary means available to protect its billions in R&D. We doubt Steve Jobs feels any differently about things. So if we can't talk about the patents themselves, what can we talk about? A lot, actually. Contrary to what you may have heard, Nokia isn't after billions of dollars, and it's not trying to stop sales of the iPhone forever. Instead, this case boils down to royalty rates -- Nokia wants Apple to pay a fair price for licensing patents Nokia says are "essential" to using GSM, UMTS, and WiFi. That's all. Nokia isn't even really asking for money damages beyond interest on past due royalties, it just wants a fair license rate for its patents. That may sound simple, but it's really not -- in fact, it's insanely complicated. A quick look at Nokia's actual complaint (PDF) reveals an impressively tight argument: Nokia says that it committed to licensing several of its patents under "fair, reasonable, and non-discriminatory" terms (or FRAND terms) during the development of the GSM, UMTS, and WiFi standards because those patents are essential to each standard's operation, and since the iPhone uses all three standards, Apple should pay to license the patents. Open and shut, at least if you believe Nokia. As you might imagine, then, determining whether a given patent is actually essential to a standard is pretty damn important, and it's not an easy or exact science. It takes a ton of time, money and specialized effort to examine patents and standards, and the results are rarely published, since they're worth a fortune to the right clients. However, there are a few studies out there that shed some light on Nokia's patent portfolio and GSM, from a boutique research firm called Fairfield Resources International. Fairfield took every patent declared essential to GSM and assigned it to an expert to judge whether or not it was actually essential. The results? 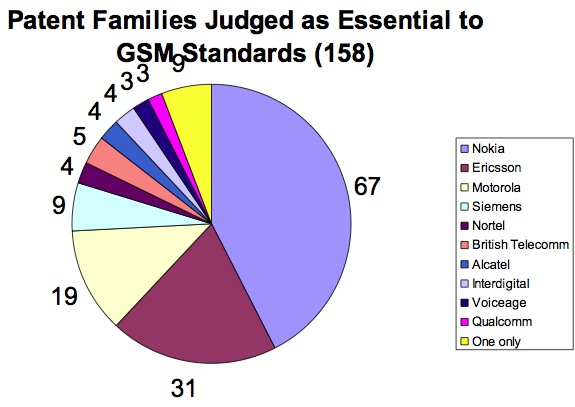 Nokia has far and away the most patents judged essential to the operation of GSM, by more than double. Nokia's in a similar position with UMTS and WiFi -- while some of the patents that it's declared essential to those standards might be fluff, it has many that experts have judged to be actually essential. What's more, Nokia's lawyers have cherry-picked just 10 total patents to sue Apple over, so we're inclined to believe that those are the clearest of the clear -- the ones that simply can't be avoided by GSM, UMTS, or WiFi devices. Based on probability alone, it's almost certain that the iPhone infringes at least some of those 10 patents, regardless of our inability to make that determination directly. So if Apple's using Nokia's tech, and Nokia's obligated by its agreements with ETSI and IEEE to offer licenses to everyone on fair, reasonable, and non-discriminatory terms, why isn't Apple paying? Would you be surprised if we told you that the answer is incredibly complicated? Because really, you shouldn't be -- especially when a word like "fair" is involved. The nature of the standards process means that when big telecom players (like, say, Nokia and Qualcomm) come to the table to hash out patent licensing agreements, each side has a pretty hefty portfolio of "essential" patents to bargain with, and they can walk away with a cross-licensing agreement instead of having to make huge royalty payments to each other. Cross-licensing agreements are incredibly common in the wireless industry, and we as consumers basically depend on them operating behind the scenes to make all these standards work. Of course, cross-licensing can break down as well -- Nokia and Qualcomm have been suing the pants off each other for years now, after all. We're inclined to believe Nokia's picked 10 rock-solid patents out of its collection of some 11,000. Apple -- or it could be asking for $100 per iPhone. As of right now we have no real way of knowing -- but since all Nokia's asked the court to do is set a price, it's clearly willing to simply accept cash and move on. So what's Apple's next move? Well, it has several options: first, it will likely say that it's not infringing the patents at all -- either because it believes the patents aren't actually essential to the standards, or because Apple bought the chips and components that use the patented technology from a licensed supplier. Nokia doesn't get to double-dip and be paid twice if Apple's suppliers have a license to use Nokia's patents and Cupertino's just buying phone components without dictating design. Again, we simply don't know the answer here -- we'll have to wait for Apple's reply to find out what tactic it decides to take, but we'd expect this to be the first line of defense. Second, it can try to to convince the court that Nokia's patents aren't valid, which would be the worst-case scenario for Espoo. Like we've said before, suing over patents is a big gamble because they might end up invalidated and no longer generate lucrative licensing revenue -- another reason we're inclined to believe Nokia's picked 10 rock-solid patents out of its collection of some 11,000. But invalidation doesn't really make tactical sense, considering all Nokia wants is a royalty -- if invalidation is Apple's strategy we'd say we're in for an easy decade of litigation, and that's not going to be cheap. And finally, Apple can just pay. We spoke to several experts in the field during the course of our research into this piece, and almost all of them were surprised that Apple hadn't already coughed up the green. Again, we don't know the royalty rates Nokia's demanding, but it's a little strange that Apple isn't using its enormous cash reserves to just make this disappear. The main issue we can see is that whatever rate gets set in this case will be the basis of all future license negotiations, and Apple's got to be careful with that -- unlike almost every other company in the space, it's become a major player in the phone market virtually overnight, and setting this precedent properly is an important step. That said, Nokia's got to feel pretty good about the rates they've offered Apple here -- filing a lawsuit means Nokia's license agreements with other companies will eventually be examined, so it'll be obvious right away if Espoo's not offering similar terms to Cupertino. Let's just say this: it's not going to happen anytime soon, but we wouldn't be surprised if Steve ends up writing a check somewhere down the line. Okay, that's a lot to think about, but let's just back up a second here and consider the big picture: this has nothing to do with Nokia's handsets versus the iPhone in the marketplace, and everything to do with the fact that Nokia's intellectual property is a critical part of making modern mobile phones work. The real questions are how much of that intellectual property is in the iPhone, and how much Apple's willing to pay -- and neither has a simple answer. Believe it when we say we've just barely scratched the first layer of complexity when it comes to patent licensing and wireless standards, and we've left out a ton of angles and strategies both Apple and Nokia could pursue. And even if we did know everything, at this point it's simply impossible to predict how this case will play out -- it could settle tomorrow, it could go on for two years, or it could linger on for two decades. As always, our hope is that both sides come to the table, figure out a royalty that makes sense, and get on with the business of developing innovative new technology -- like we've said before, the lawyers get paid that way too. Disclaimer: Although Matt and Nilay are lawyers, they're not your lawyers, and this isn't formal legal advice or analysis. To the extent this article might contain any statements regarding infringement of a particular patent by a particular device or what those patents cover, those statements are attributable to Nilay, not Matt, who still makes a living by giving actual legal advice to actual clients.